These brightly coloured characters makes one think of a children’s programme. … a Brazilian children’s programme, in all likelihood. If that ship isn’t crewed by Cat People I will be very disappointed. Late last night, the neighbours decided to split the difference between Canada Day/Independence Day and Guy Fawkes’ by setting off some fireworks. At our windows. Not outside, at. The subsequent lack of sleep is not helping my head cold, my day at work or my plans for my business trip tomorrow. A notable theme running through his work (most notably the ‘Dead’ trilogy) is agalmatophiliac male lust for young female gynoids, as well as the darker undercurrents of British national culture. His novels and stories have links and plot overlaps between one another, and together form a mythos. 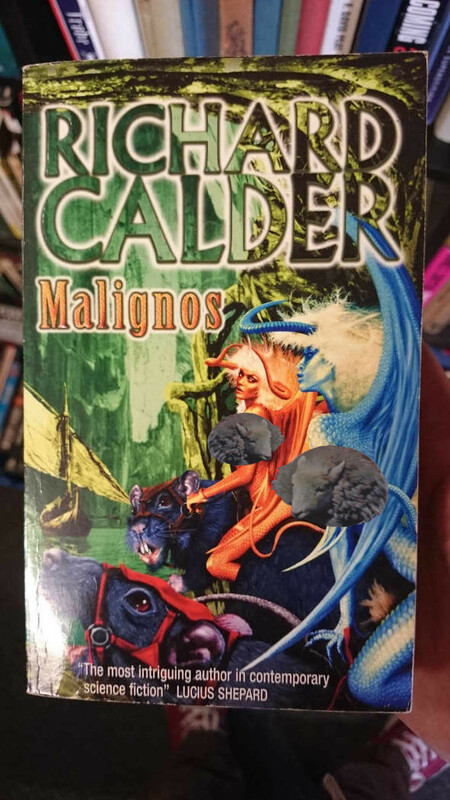 His “epic masterpiece” (“Reading Richard Calder”, Claude Lalumière) is said to be Malignos (2000). Yes, it certainly sounds like a three space sheep novel. @DSWBT—glad to hear you are soldiering on. A day without Dead Stuff is like a day without a naked babe riding a rat. They need those rats to carry all that hairspray they must need. They have wings, so why are they riding horses? Or are they a “scientifically accurate” kind of winged humanoid, who are too heavy for their wings to carry them? Well, they’re riding rats, so presumably they’re really small and wings wouldn’t get them anywhere against any kind of headwind. Like people breathing. In the next town. The thing is, I don’t think those can be wings as they are attached to the shoulder itself and not the scapula. It’s probably their sound-system. They play the effect of thundering hooves so people think they’re mighty warriors and don’t look down to see two scabby bints on rodents. With Don King hairdos. Rat 1: Hey, Willard, I thought we were supposed to desert sinking ships. So why are we heading toward that hulking vessel offshore? Rat 2: Sniff, sniff, is that patchouli? @ Anna T. An alternate, much less explicitly detailed cover does show one in flight. But on the other hand…….GIANT RIDEABLE RATS. @fred: Rodents of unusual size? I don’t think they exist. Philip Hinchcliffe reveals the original version of the giant rat scene in ‘Talons of Weng-Chiang’ was even more Mary Whitehouse-unfriendly. @Dead Stuff. If I were to google “agalmatophiliac”..l would I regret it? @RachelJ: as long as you do NOT do an image search, you should be fine. Rodents of Unusual Size. I see. Ladies and gentlemen, I think we may have some escapees from the Fire Swamps here. At a recent NASA press conference, a committee of scientists explained that the probability of encountering aliens on other planets who resemble attractive human women is zero percent. Howls of protest came from the audience. @A.R. Yngve—However, according to those same scientists, the probability of encountering giant rats fit for riding appears to be quite high.